What a great thread! Keep them coming! Great photo of "sheeple", Grindboy. Holy crap! I've never seen that many people on a mountain! Where/when was this?! Very cool pictures everyone. Keep 'em coming! I have a few ill have to put up later when I get near a computer. Still can't figure it out on my phone. I'm gonna guess that's looking south at Little Haystack's summit. At trail-head getting ready for hike. Where was this? We had a great time watching a mama fox and her youngins on Mt Clinton Rd near the parking lot. I think I must have run out of camera batteries because I didn't take any photos. But very very cute. I also ran into a young fox on a hiking trail in Boulder, CO. His mom was off trail yipping for him to come but he stayed and inspected me. Then took a little poo and sauntered off trail. It was near the $5 lot at the cog base. This one was at the Willey House. This one was at Bretton Woods. Each time they were looking for a hand-out. Craig, why must they be "sheeple?" Or was that just an attempt to find a wild-life word for a group? It's true that it was an absurdly large group, but I can't blame them for being there (I was there too, after all). And I'm glad they stayed on the trail! Granite Guy's very close, that was taken from the summit of Little Haystack looking north. It was last June 11, a Monday no less. Anyway, they were going CW and I was CCW, so we crossed paths at LH but that was all, didn't really hamper the fantastic day for us. 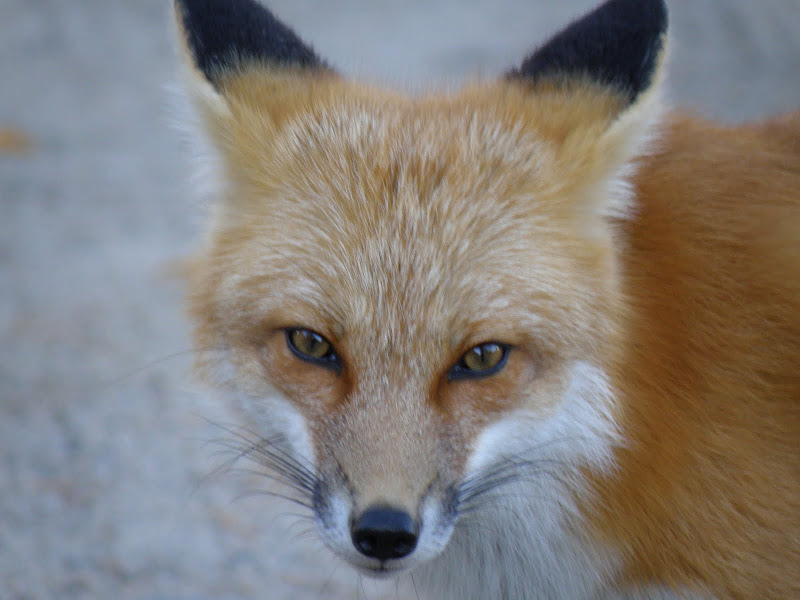 Either unrelated or back on topic -- I think foxes are strikingly beautiful. Those are (as always) great shots Joe. Even though it's not a "face shot" I really love the one with the bright red body against the bright green grass. Great thread! Thanks for starting Joe! As always your shots are amazing. Really enjoyed everyone's pics. Grindboy I laughed and laughed at yours. I thought 'sheeple' was a great tag, because after all this is a wildlife thread. I've never seen a moose or fox on the trail, only on the road and without a superzoom, bird shots are pretty tough, well except for grey jays. So here's a marmot from Rocky Mountain NP. Cheeky little guy right on the trail. I meant no ill with the term sheeple... sorry if you took it that way. Simply looked like a herd of people to me and sheeple came to mind. 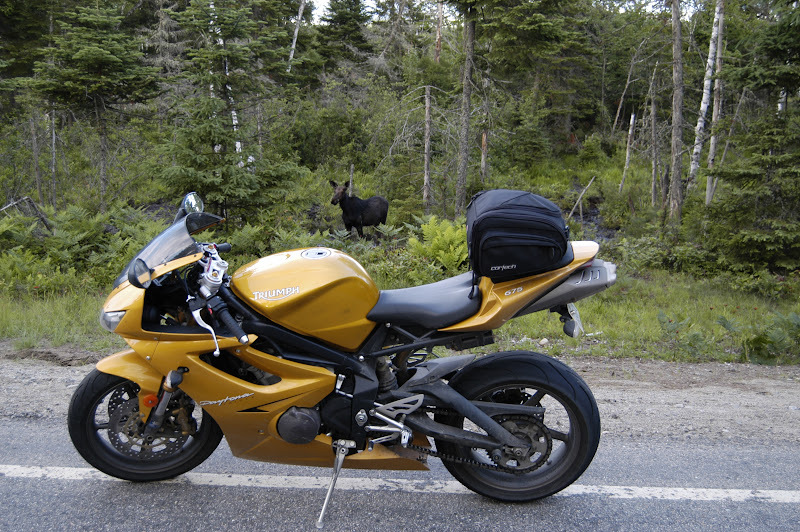 Great photo of the bull and cow moose. Thats a monster bull too! Wow. That picture of Franconia Ridge with all those people does say a lot. I've never been up there when it was at all crowded. People have told me it gets busy up there, but wow! Grindboy- was it like that all the way up there? Or, was this just a group you captured in one shot? I have no idea how this double posted with a post in between??? Very weird. Last edited by CraigB on Tue Feb 19, 2013 9:34 pm, edited 1 time in total. Ok, so since it doesn't have to be be hiking. Here is a shot on the return trip from Cape Breton Island Nova Scotia (specifically went to ride the Cabot Trail). The photo was actually taken in 13 mile woods in NH between Errol and Berlin. Saw some cars pulled over figured there was a moose to be seen. After admiring from the other side of the street for a while I walked the bike over, snapped the photo and we were off again.